Encompassing the northern part of the Namibian coastline and extending into southern Angola, the Skeleton Coast National Park is infamous for inaccessible shores and rough waters. Often, the entire coastline of the Namib Desert goes by the name the Skeleton Coast. The local San used to call it 'The Land God Made in Anger', while Portuguese sailors named it 'The Gates of Hell'. It's a barren yet hauntingly beautiful destination for photographers, its natural formations create a surreal world all its own. 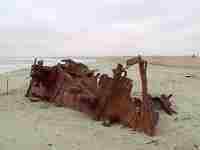 An intimidatingly desolate coast, the Skeleton Coast got its name because of the hulls of wrecked ships washed up along the shore as well as bleached whale and seal bones found during the active years of the whaling industry. The Skeleton Coast National Park has some interesting attractions, including the Agate Mountain saltpans, the clay castles of the Hoarasib, and the large Cape fur seal colony at Cape Fria. Known as a great surfing destination and a stunning night sky, the heavens are undimmed by human settlements. A number of nature documentaries film footage along the coast, most notably productions led by celebrated figures like Sir David Attenborough. Its inland riverbeds are home to a variety of wildlife, including giraffe, lion, baboon, rhinoceros, springbok, and elephant.